We’ve seen Jason Momoa as “Aquaman” already in Batman vs Superman: Dawn of Justice and Justice League. But now he is the main character in a film that explores his origin story. We learn that he is the result of a union between “Tom Curry” (Temuera Morrison – Star Wars: Episode III – Revenge of the Sith) and “Atlanna” (Nicole Kidman – Lion). She had fled the ocean world to escape her betrothal to the King of Atlantis. She and Tom fall in love. When Arthur is a young boy, warriors from Atlantis storm the lighthouse home of the happy couple to force Atlanna to return to Atlantis and marry the King. She decides to go back, to keep Tom and Arthur safe from harm. She promises to return. She also arranges for the King’s Vizier, “Nuidis Vulko” (Willem Dafoe – The Grand Budapest Hotel) to inculcate Arthur into the history of Atlantis, and to train him to fight. Fast forward to the present and we watch some kind of stealth underwater craft attaching itself to a submarine. The pirates aboard that craft are led by “Jesse Kane” (Michael Beach – Patriots Day) and his son “David” (Yahya Abdul-Mateen II – Baywatch). Aquaman intervenes to rescue the surviving sub crewmembers and is attacked by Jesse and David. His intervention leaves David desperate for vengeance. Arthur goes home to see his father, who walks to the edge of the dock every morning, to share a beer. A submarine attacks the undersea world, giving Arthur’s half-brother “Orm” (Patrick Wilson – The Founder) an excuse to wage war on the surface world. As the current King of Atlantis he needs the allegiance of the Kings of three of the six kingdoms that splintered away from Atlantis after its fall from the surface to the bottom of the sea. “Nereus” (Dolph Lungren – Creed II) is the king of Xebel and he witnesses the submarine attack. They agree to unite and attack the surface as soon as they can bring the Kings of The Fishermen and The Brine into their alliance. Doing this will allow Orm to proclaim himself Ocean Master. His betrothed, “Mera” (Amber Heard – Who Loves Mandy Lane), dauther of Nereus journeys to the surface world seeking Arthur’s help to stop the attack. She convinces him to travel to a safehouse where they rendezvous with Vulko. His plan is for the two of them to find the Trident of Atlan, which will enable Arthur to claim the throne of Atlantis. That plan goes awry when Orm’s warriors arrive and manage to capture Arthur, while Mera and Vulko escape undetected. Orm confronts his half-brother and goads him into issuing a challenge to Orm for battle. Mera intervenes and they escape to the surface to search for the fabled trident. Now the race is on to see who can achieve their aim first. 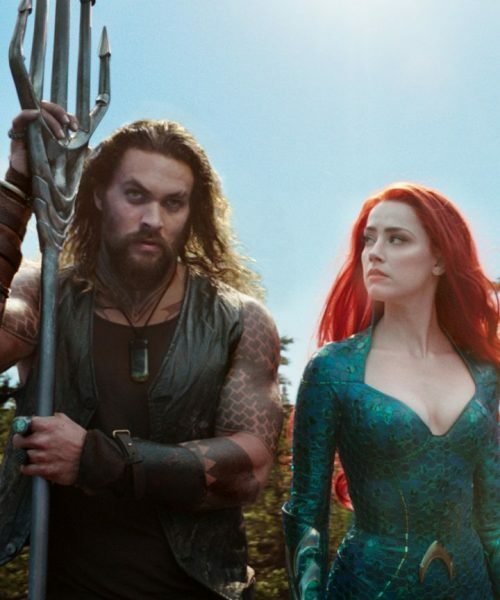 Can Orm co-opt the other two kings before Arthur and Mera can get the trident? Will David Kane stand in their way? Aquaman has some decent action sequences, some wonderful wide-screen visual shots and a few moments of humor that work. But those things cannot overcome the weak story and dialogue. Jason Momoa has charisma and the physicality to be a great action star, but he’s still growing as an actor. Nicole Kidman and Amber Heard give strong turns but that also isn’t enough. I found the casting of Willem Dafoe an unusual choice. It probably wasn’t intentional on his part but there were eerie echoes of his work as “The Green Goblin” in 2002’s Spider-Man throughout his screen time in Aquaman. If you are a fan of the DC Comics heroes, you will like this. If you aren’t, you won’t.